The Ryanair Boys are Back in Belfast | SCENE! Ryanair return to Belfast, only this time they’re at the International. Today David O’Brien from Ryanair, Europe’s favourite airline, announced what he called ‘the worst kept secret in aviation’. Ryanair, after five years in exile, are back in Belfast, with plans to base at least 3 planes at Belfast International servicing five, or more, routes. To start with, however, Ryanair have 1 based aircraft and a 4 times daily service to London Gatwick. The flights will be starting from March, but if you are planning to travel get your apps loaded now. 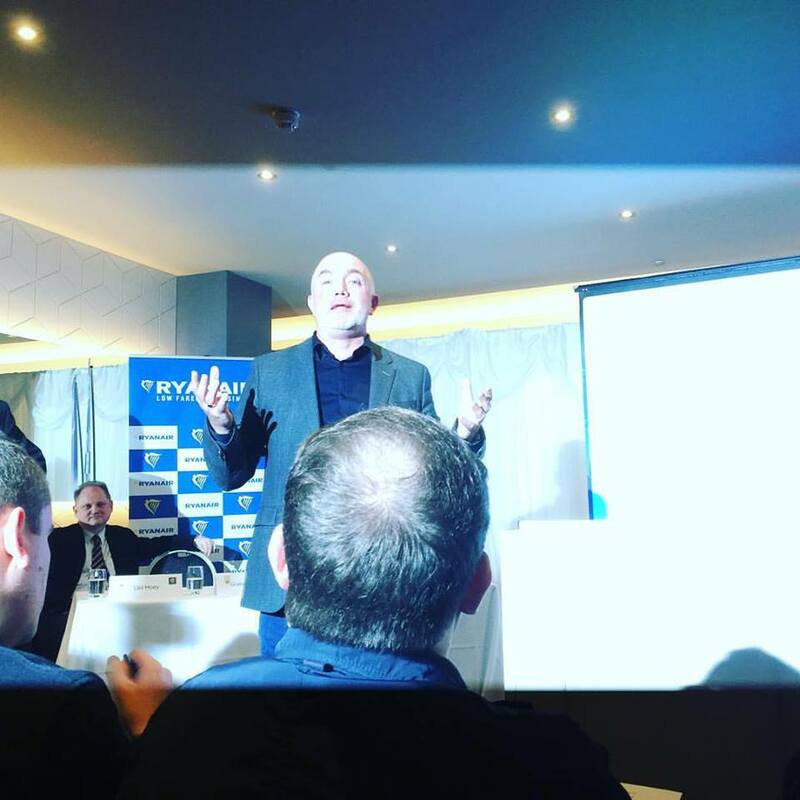 O’Brien went on to talk enthusiastically about Ryanair’s plans for Belfast International, confident that Northern Irish passengers would quickly remember why they loved the airline. That enthusiasm was, however, tempered by warnings – from both O’Brien and Graham Keddie, MD of Belfast International Airport – about the deleterious impact the APD (Air Passenger Duty) has on their plans to expand further. Describing Northern Ireland as ‘geographically disadvantaged’, O’Brien stated that Ryanair’s decision on the five future destinations from Belfast International would be influenced by the APD levied on the airline. Five future routes are guaranteed, but without some consideration from the government – such as was made for KLM’s route to Amsterdam – Ryanair was not willing to take the economic risk on the longer European flights. Keddie, MD of Belfast International Airport, said: ‘This is a significant and far-reaching announcement by Ryanair. The Gatwick slots given up by Aer Lingus as part of the IAG takeover, are being safeguarded and used for the benefit of Northern Ireland. Gatwick is growing in popularity, and it was crucial to retain them. Whether Northern Ireland is going to enjoy affordable flights to Barcelona or not, it is a boon to the region to have Ryanair back. As O’Brien pointed out, 864,000 NI passengers – many heading to the UK – travelled from Dublin in 2014. Now they won’t have to pay the toll down. Now get booking! You only have until 11 January.